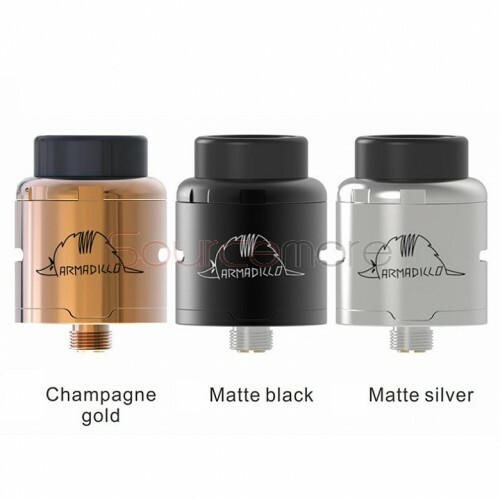 Oumier Armadillo RDA is a collaboration between Oumier and the Belgian YouTube vape reviewer - Dimi Crazy Damper. The deck has a weird “bridge” shaped post arrangement with 3 clamp screws and holes in each post. You can see the “Armadillo” inspiration now with the shape of the posts. It comes with a unique build deck for dual coils building. And it is compatible with coils of different size. Plus the adjustable airflow system, it will bring you a great vaping experience. Available in Matte Silver, Champagne Gold and Matte Black.